As I become more serious about my writing, I'm hoping to add another feature here on the blog. Wordsmith Wednesday may not happen every week quite yet, but it's reserved for things that specifically have to do with my writer's journey. We're going to kick it off with a book review! How long does it take to become a better writer? These five-minute chapters are each designed to help you master an aspect of the writers’ craft. From prewriting and character development through plotting, editing, proofreading, and on to the options available in publishing, we will help you with every step of your writing journey. No matter where you are in your process, there is something you can learn that will make your writing stronger. The path from writer to author is an obstacle course of pitfalls and secret rules. Five Minutes to Success promises to help you overcome each roadblock on your road to publication. With exercises and worksheets for each topic, we promise tips and tricks to make your work shine. We’ll give you the writing world. I first heard about this book not long after it was released. A friend of mine happens to know both of the authors and was encouraging everyone that he knew to pick it up. Eventually, that's just what I did. Then, it sat on my Kindle until this past week when I decided to start really working on my education as an author. I confess that I didn't do a 5 minute lesson each day. If I had, it would be another 6 years before I wrote this review. Okay, that's a bit of an exaggeration, but this book is long. There is a ton of great information within the pages of this book. 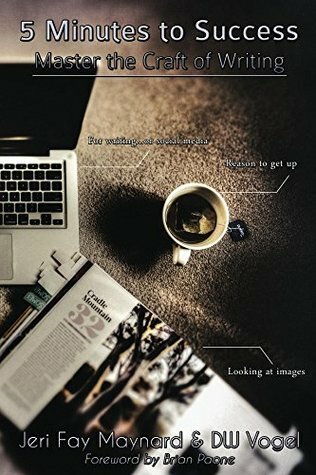 Even if you're not new to writing, this book will serve as a great refresher course. Each section has a little assignment at the end which will help the knowledge acquired sink in even further. This is one of my favorite things about this type of book. I'm a put it down in pen and ink kind of learner so having study questions really helps. While it is stated that there are two authors for this book, the book really reads as if only DW Vogel (known as Wendy in the book) wrote it. I believe there are only one or two occasions where Jeri's opinion is stated. Also, there are locations where the punctuation is off (primarily section 1) and at least one point where a sentence's subject's gender changed mid-sentence. There are some other errors in the book, such as Deus Ex Machina being listed as Deus Ex Machine and the author's use of the term dialog instead of dialogue. Granted, that last one is a pet peeve kind of thing for me. It isn't technically wrong, but it isn't the preferred form of the word. Dialog should be reserved for software design in my world. If you can overlook the issues that I mentioned above, don't hesitate to pick up this book. It doesn't matter if you're a first time writer or someone who has been at this for a while, I'm pretty sure that you can find something in there that you can use. I do want to point out that the emphasis is more on traditional publishing, but again, don't let that stop you, self-publishers! I have no desire to have an agent or be signed to a big name publisher and I have pages and pages of notes to refer back to.